RADWANIYAH, Iraq, July 18, 2010 (AFP) - A suicide bomber targeting anti-Qaeda militiamen being paid their wages killed at least 45 people west of Baghdad on Sunday, in Iraq's deadliest single attack in more than two months. Forty-five people were killed and 46 wounded in the 8:30 am (0530 GMT) bombing in the mainly Sunni Arab district of Radwaniyah, a former insurgent hotspot 25 kilometres (16 miles) from the capital, a defence ministry official said. The fighters from the Sahwa (Awakening) militia were queuing outside an army base to receive their wages when the bomber struck, a commander at the scene said. "Hundreds of Sahwa members were gathered close to the entrance to the base," the officer told AFP, asking not to be identified. "The suicide bomber blew himself up in the biggest group of Sahwa members. We generally let them enter the base in groups of 10 for them to get their salaries," he added. A second officer at the scene said the attacker was a male in his 20s. The bomber, who wore a dishdasha, or traditional long robe, was acting strangely and approached the base quickly, said an Iraqi soldier who asked not to be identified. He added that another soldier who was wounded in the attack yelled at the bomber and fired shots in the air to try to stop him, but he shouted "Allahu Akbar" (God is greater) and exploded instead. The bombing left traces of blood, tissue, shoes and pieces of uniform along the wall of the base, an AFP photographer reported. Recruited from among Sunni Arab tribesmen and former insurgents, the Sahwa militia is credited with turning the tide in the war against Al-Qaeda in Iraq. Also known as the Sons of Iraq, the group took up arms against the jihadists with US backing in late 2006 and has since been on the receiving end of repeated retaliatory attacks. 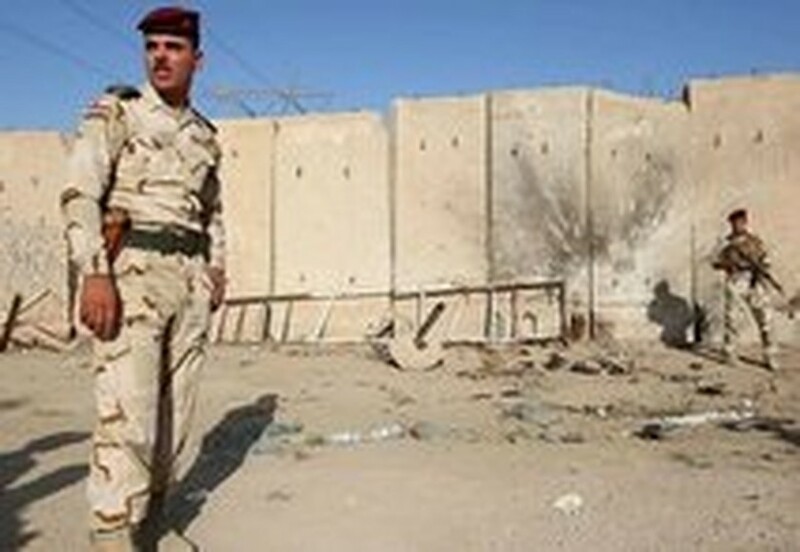 A second suicide bombing targeted the militia on Sunday in the town of Al-Qaim close to the Syrian border, police said. The bomber blew himself up in a Sahwa office in the town, killing two militiamen and a policeman, and wounding six other people. Control of the Sahwa passed to Iraqi authorities in October 2008, and their wages -- said to have been cut from 300 dollars under US leadership to 100 dollars -- have been paid, often late, by the Shiite-led government. Baghdad has promised to incorporate 20 percent of the Sahwa into the police and military and to find civil service jobs for many of the rest, but the process has been slow and is fraught with risks. In the past six months, many Sahwa fighters and members of their families have been killed in revenge attacks. The former rebels and tribesmen fret that they are not only in the firing line for Al-Qaeda but also viewed with suspicion by the central government. The bombing in Radwaniyah was the deadliest to hit Iraq since May 10 when three car bombs at a factory in Hilla, south of Baghdad, followed by a fourth targeting emergency workers, killed 53 people. In a third attack on Sunday, a magnetic bomb placed on a civilian vehicle killed one person and wounded three in Ur, a mixed neighbourhood of east Baghdad, the interior ministry said. There are currently 74,000 US soldiers in Iraq but this number will fall to 50,000 by August 31 as the combat troops withdraw, leaving a training and advisory force behind which is due to pull out by December 2011. US Vice President Joe Biden told ABC's "This Week" on Sunday that the United States remains on track for its drawdown despite the political stalemate in Baghdad.